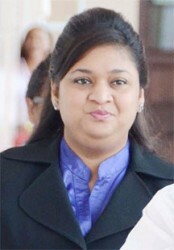 An investigation carried out by the Ministry of Education has determined that the children from the Kato Primary School, who were allegedly made to fetch logs for their meals, were only asked to do it twice, Minister Priya Manickchand said on Thursday. The investigation was carried out amidst claims by a Region Eight councillor that it had undoubtedly happened more than two times. Manickchand disclosed that personnel from the ministry were sent into the village on June 13 to receive feedback on what transpired and had compiled a report on their findings. She said that at a meeting held at the school with pupils, teachers, cooks, parents, the Assistant Regional Executive Officer, a police representative and other community stakeholders, it was ascertained that the incident only occurred twice, and it was a result of several breakdowns in the extant system. This, she said, was confirmed by school’s Head Cook. She said the report of the investigation revealed that firewood was required since there are no gas bottles to facilitate the use of the school’s gas stove. Normally, the report said, the responsibility for gathering the firewood is the community’s. “Wood is cut by a villager who has a chainsaw and then transported to the kitchen by the community tractor,” Manickchand said, reading from the report. The supply of wood cut by the villager and hauled by the tractor is intended to last the entire school term. The report stated that the wood to be hauled to the school’s kitchen had already been cut, but since the tractor was not fully operational, the children were asked to fetch wood from the Head Cook’s farm which is 20 minutes away from the school. “The claim that the children trek for miles three times per week for firewood which is gathered from the forest is completely erroneous,” the report said. The report went on to state that the permission was given for the children to assist in the fetching of the wood against the advice of the Head Cook and the “teacher in charge”. It was found that the District Education Officer was the one who gave the permission to another cook to have the children assist with the hauling of the firewood. This permission was given, Manickchand said, even though there was still some amount of firewood in the school kitchen. The report stated that the though the District Education Officer gave the permission for “three or four big boys” from the secondary school level to assist in fetching the firewood, the cook informed the teacher in charge that permission had been given for the children to fetch the wood. As it relates to the pictures taken, the report stated, “some persons alleged” that the councillor who took the pictures requested that some of the children pose with wood from the school’s kitchen because he was not sure that he would be around when the children returned. As it turned out, the councillor was still there when the children returned and took several more pictures. Manickchand said that several steps will be taken to prevent a recurrence of this event. She said that all four hinterland regional officers have been advised to communicate with schools in their districts to ensure that they are not engaged in work-related activities associated with the provision of meals by the school kitchen. She also said that all schools on the feeding programme will be required to sign a new contract which contains important particulars including the prohibition of children from being involved in feeding programme related activities. Refresher training will also be provided during the August vacation to deal with feeding programme related activities. These, according to the report will be carried out in all four hinterland regions. The school has also been advised to purchase two gas bottles and another gas stove if necessary. Ultimately, the minister said, the occurrence was regrettable, and the ministry will use this experience to ensure that all of the schools which run a community-based feeding programme do so in accordance with the strict guidelines which govern the programme.